The SIMULIA Living Heart Human Model provides a unique testing environment where a stent can be deployed virtually in coronary arteries and deformed mechanically during the cardiac cycle. 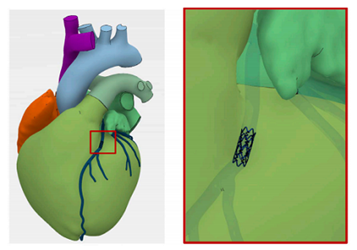 Once the mechanical deformation results are obtained, the long-term durability of the stent can be assessed. The virtual nature of the test provides a physiologically accurate methodology to test new and existing devices without exposing patients to unnecessary risk. For additional information, download the technical brief.